In Run Like an Antelope, Sean Gibbon is nearly as squeamish about meeting the members of Phish as some of the cast of "Survivor" were about eating slugs. Even when he has a backstage pass, the writer seems almost superstitiously averse to trying to interview "the boys," as if he would be pushing his luck somehow. This despite the fact that he’s run into them before, casually, in Burlington. 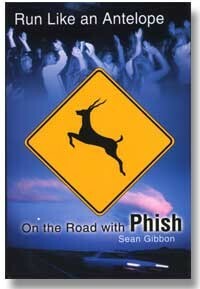 On the Road with Phish, therefore, might be a somewhat misleading subtitle for Gibbon’s new paperback release. Readers who pick it up hoping to vicariously go behind the scenes with the band will be disappointed. On the other hand, "on the road with Phish" is simply the expression used by the hordes of devoted fans who follow the band like gypsies, attending as many shows as possible. In Gibbon’s case, it was a month of the 1999 summer tour, and Run Like an Antelope is amply enlightening as an inside-the-scene account of fans’ life on the road. Their kaleidoscopic experiences range from the terrible – endless traffic jams, deadening Midwestern heat, bad food and occasional freak-outs – to the transcendent: the music. I steer clear of the breakfast burritos. I’m trying to eat as little as possible at Oswego in a serious effort to avoid Porta Potties, which are indescribably awful even with the tanker guys working around the clock. A friend of mine had a terrible experience in one. He ate some mushrooms and then a little while later he stepped into a Porta Potty. It was overflowing, he said, but he had already started, you know, too hard to stop. So he said to himself, Stay calm, a few more seconds… he walked out, took a deep breath, and projectile-vomited in the direction of a garbage can. Time to get this thing started. I’m on the road for a month, following Phish, living with the fans in campgrounds and motels for the summer tour. Twenty shows in thirty days. The idea is to write from the inside out, the crowd’s perspective. The Phishheads. The traveling cult. The whole scene. The book deal went down in the last week or two and the contract isn’t hammered out just yet. My agent assures me everything is in the works. Check’s in the mail. It gets the idea across, but this paragraph is just the beginning of a slow build-up to the tour itself, and it signals a self-absorption that is sometimes mildly annoying. Gibbon himself says it a few pages later: I just need to get this trip started. I feel like I’m on a team that’s made the playoffs and I’m sitting around the locker room waiting for the game to begin, thinking too much, wondering what’s going to happen. So does the reader. About mid-way through the book, though, it begins to feel like Gibbon’s writing style, consciously or not, mirrors the experience and rhythm of being on the road. A sense of wonderment throughout. Copious attention to the mechanics of traveling. Exasperation when he thinks he can’t take it anymore: the heat, the sleeplessness, the sheer boredom of waiting in lines – and anxiety when he eats some super-potent brownies, which land him in an emergency room and discourage him from doing any more drugs the rest of the tour. Some of a parent’s worst fears will be verified by this book: Drugs of all kinds are superabundant and, at the larger concerts, are as out-in-the-open as the ubiquitous grilled-cheese merchants. For many fans, selling drugs is what enables them to go on tour in the first place, and their underground micro-economy is a given. On the other hand, the Phish crowd, according to Gibbon, generally lives up to its peaceful, happy, childlike reputation. Later in the summer, and the book, when he hears reports of Woodstock ’99 – the riots, the arson, the rapes – the contrast with Phish shows comes into sharp relief. At this point you’re really moving. I mean, you can barely keep up with their pace. You feel like a goddamn antelope. Antelopes are fast mothers. Drenched in sweat, loose, limby, you can dance better than you ever thought you could. Really groovin’, rubbery. And you’re not dancing with anybody in particular. No partner to account for, so you can let it rip. In this moment at a show there’s almost nothing in the world I’d rather be doing. Gibbon conveys with awe the "ferocious energy" that even skinny, underfed Phishheads muster for a show, dancing as if their lives depended on it. And at that moment, perhaps they do. "The music," he writes, "is a bolt of life for Phishheads." I mean, it is an adventure. And there’s something old-fashioned about it. We have nothing to do with computers out here, nothing to do with television, or the World News Tonight, or professional sports. We’re out here on the highways, a gang of cowboys–road cowboys with rest areas for watering holes. We pull up in our dusty rides, step out stiff-legged from the journey, nod to one another, and talk about life on the road. Where else in American life can you find this? Is anyone else doing this, living with a cult on the road, traveling the nation’s interstates, beating drums as they go? Not since the last decade’s Deadheads, no. And the acid-dropping Merry Pranksters before that. Gibbon, pushing 30, admits he may now be "getting too old for this," too. For their legions of loyal fans, Phish have "tapped a nerve in America," he trumpets. For those of us who have not been tapped, or are too ancient or too busy to make the trip, Run Like an Antelope may prove to be an engaging second-hand fantasy – or a validation of those day jobs.